Opened to the public in July 2015 and nestled within the verdant hills of the Sunshine Coast Hinterland, the Maleny Golf Club’s quality, 9-hole course provides visitors with a picturesque, links-style ‘golf as it began’ playing experience. The innovative design by golf architect Graham Papworth, takes full advantage of some excellent natural assets – gentle rolling hills, well-drained volcanic soil, existing kikuyu pastures, surrounding rainforest and some wetland. The course has been built to a high standard by a team of dedicated volunteers under the direction of Course Superintendent Mick McCombe, using the latest agronomic technology and knowhow to construct the tifdwarf greens. Two shipping containers have been cleverly combined to provide a rustic, temporary HQ which enhances the overall visitor experience. Work still continues on improving the first 9 holes and plans are well advanced to develop the second 9 in stages, before the establishment of a permanent clubhouse and pro-shop. The course is constructed on land leased from Sunshine Coast Council (SCC), which forms part of the Maleny Community Precinct, and comprises two former dairy and cattle farms (Armstrong’s Farm and Porters Farm) located in North Maleny. The course is located just a few minutes from Maleny town centre. Visitors are welcome and the Golf Shop has clubs, pull buggies and electric carts for hire as well as snacks and light refreshments for sale. MGC Patron, Andrew Powell MP and Councillors Tim Dwyer and Jenny McKay opened MGC’s temporary driving range in July 2010. Planning and construction of the first 9 holes of the course then began and were completed and opened for play in July 2015. Graham Papworth a golf course architect,has been designing golf courses for more than 30years did the design work as a Result of Maleny Golf Club’s successful application for a $100,000 Queensland Government “Getting Places and Spaces” grant to help finance construction of next three holes. 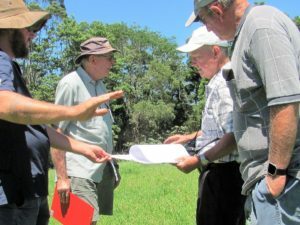 The second nine holes planned and working on the detailed design of the next three holes on an agreed parcel of land,” Mr Papworth said (pictured 3rd from left with Mick, Sel Hopely and Rob Bailo). Maleny Golf Club President Dr Max Whitten said in addition to the State Government grant, the Club was also in discussion with the local Sunshine Coast Council (SCC) to secure continued financial support. Mr Papworth said the presentation and quality of the Maleny Golf Club course was remarkable given the budget and resources available. Mr Papworth said the quality, presentation standard and playing interest of Maleny’s elevated hinterland course would surprise many golfers. “When these other holes come on line and the course is expanded to 18 holes I think Maleny will become a highly sought after golfing destination and something quite unique from a south-east Queensland perspective,” he said. Mr Papworth said the terrain, surrounding vegetation and open rolling pasture-like appearance all contributed to Maleny’s appeal. Mr Papworth said the club was very keen to push on toward completion of all 18 holes. Progressive development of Maleny Golf Club will significantly boost the estimated $3.5 million value of the SCC’s existing community sports and tourism asset. SCC agreed at its July 2016 meeting to consider providing additional financial support for expansion of the course to 18 holes. Each of the nine holes presents its own challenge and the Graham Papworth-designed course is maintained to a very high standard. The Par 35 layout provides a rewarding and enjoyable golfing challenge for players of all standards in beautiful surroundings with a temperate climate and cool prevailing breezes. The Graham Papworth-designed Par 35 course, comprised of six Par 4s, two Par 3s and one Par 5, is a relatively short 2618m off the white tees. However, players will encounter some stern tests of golf along the way, including a penal kikuyu rough for those who stray from the well-defined fairways. Our first nine holes are open for play 7 days a week. Planning has commenced for the second nine holes, however there is no timetable as yet for this work. The Sunshine Coast Council unanimously approved our amended lease boundaries at their meeting in late February, returned a Licence to Use area and endorsed plans for restoration of the Southern Wetlands. Maleny Golf Club has the next three holes is expected to get underway in the second half of this year. Nature-lovers on the Sunshine Coast will have greater access to some of the Hinterland’s pristine wetlands and the local golf course will continue expansion plans after council today voted to endorse the final lease areas for Maleny Golf Inc, and the Southern Wetlands Landscape Plan. The plan will help guide council in wetlands rehabilitation and establish greater opportunities for partnerships with volunteers. It will also ensure public access and viewing points, creating a haven for animal lovers and birdwatchers. The adoption of the plan will also enable the Maleny Golf Club to continue with their planned expansion and development of an 18-hole golf course with support from the state government. Councillor for Division Five, Cr Jenny McKay, said the agreement reached with council and the golf club was a win-win for both parties, and would deliver great benefit to the wider community. Maleny Golf Club membership has a year that runs from 1 November to 31 October the following year. Membership categories include an unlimited green fee option for regular golfers (Gold), a ‘pay-as-you-play’ option for golfers who have limited time to play but still want to have a handicap and enjoy the benefits of golf affiliation (Silver) and a club supporters option (Bronze). Discounted membership options are available for younger golfers: Intermediate (18-22 years) and Junior (under 18). For age-based memberships applicants must be the appropriate age on 1 November of that membership year.